Yacht Consultants Asia (HK) Ltd has been requested to offer our Chinese Client, a well known USA Yacht Manufacturing Company to invest in or buy out. Our Client is well respected by the Central Government of China, and very successful in non marine manufacturing and distribution of electrical /electronic equipment. His interest in your company will be based on marketing ability and lucratively. He has spent a great amount of time and money researching the International Pleasure Yachting industry, practicing in depth due diligence. Joint Ventures, Capital Investments or Co-operations are also of interest…and proven management processes will be kept in place. 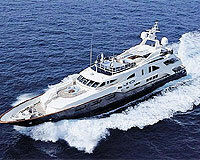 If your Company is available, well established, and Yachts very well respected and proven globally, please contact us. Your reply will be kept strictly confidential and offered to this Client only, unless authorized by you in writing. Please send NDA with returning instructions in advance of detailed information if required, otherwise send a particulars summary to William E. Baycroft – Pres YCA (HK) Ltd.